The Highway To Heaven TV show was a 60 minute family drama series on NBC about a new angel named Jonathan Smith who was on "probation". His probationary assignment was to help people by helping them see that things like love for your fellow man, charity, and forgiveness were better models for a happy life than are hate, greed, and bitterness. He got help from ex-cop Mark Gordon who was Jonathan's first success. They drifted from place to place carrying out the heavenly missions as instructed by "The Boss", an entity that only spoke to Jonathon. 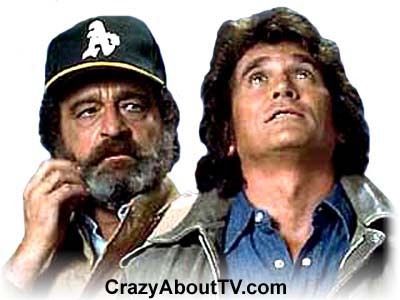 Michael Landon wrote and directed a large percentage of the scripts himself as did Victor French (to a lesser degree). The first two episodes, "Highway to Heaven - Parts 1 and 2", originally aired as a pilot movie. Then they were re-edited so that each of the two episodes could stand on their own as seperate episodes for syndication. Highway to Heaven received seven Emmy nominations but never brought home a win. Four of those nominations were thanks to cimematographer, "Ted Voigtlander". When you include the others series he worked on, he received a whopping fourteen nominations and turned two of them into wins! Both of the wins were for "Little House on the Prairie". Some of his other nominations include ones for episodes of "Bonanza", "Ben Casey", and "The Wild Wild West". Michael Landon's first acting role was in the 1956 film, "These Wilder Years" starring James Cagney, Barbara Stanwyck and Walter Pidgeon. He wasn't listed in the credits because it was just a bit part but if you don't blink, you can see the 19-year-old Landon in the scene in the pool hall. Highway to Heaven was a great venue for Michael Landon. It's hard to find anyone who knew him that has anything but praise for him and most emphasize that he was a kind, caring, gentle man. Most of the Highway to Heaven episodes also emphasized the idea that being that type of person is what results in the best life. One episode stands out for a totally different reason. In episode #79, Michael pokes fun at the film that gave him his first big break. That was, of course, the 1957 movie, "I Was a Teenage Werewolf". Episode #79 of Highway to Heaven was titled, "I Was a Middle Aged Werewolf". While Victor French is not typically listed as a cast member on "Little House on the Prairie", he did appear on 36 episodes in the role of "Isaiah Edwards". Victor died in 1989 from lung cancer, not long after filming the final episode of Highway to Heaven. While his death may have contributed to the demise of Highway to Heaven, it wasn't necessarily the only contributing factor. Victor French wasn't the only old pal from a previous series who worked with Michael Landon on Highway to Heaven. Lorne Greene from Bonanza appeared in episode #33 titled, "The Smile in the Third Row". Thank you for visiting our Highway To Heaven page!